Rajesh Koothrappali from The Big Bang Theory is here! Raj! Your The Big Bang Theory collection is incomplete without astrophysicist Rajesh Koothrappali! 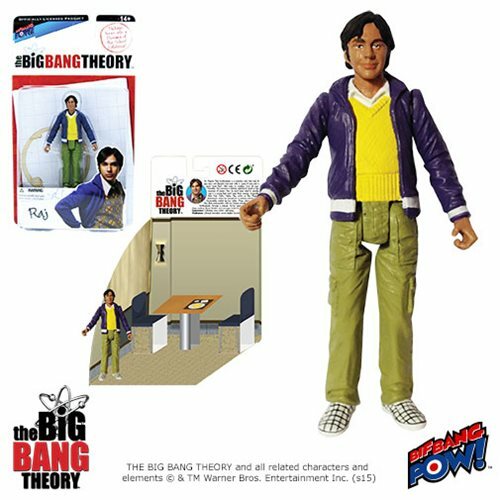 Derived from the The Big Bang Theory, The Big Bang Theory Raj 3 3/4-Inch Series 1 Action Figure is crafted of plastic and features multiple points of articulation. Raj is ready to join the fun. Are you? Ages 14 and up. But wait, there's more! Raj comes in totally unique full-color packaging that turns into a diorama that includes pop-up features. Pose your figure to recreate popular scenes from the show! Dr. Rajesh "Raj" Koothrappali is a sensitive soul; the kind of guy who’s not afraid to kick back with a glass of wine and a good “chick flick”. But make no mistake, he’s all man. Recently, Raj overcame a lifelong inability to speak in the presence of women. Now, he must learn what to actually say to a woman that won’t send her running. Originally from New Delhi, India, Raj works in the Physics department, where he specializes in particle astrophysics. Occasionally visited by his sister, Priya, who’s a lawyer, Raj often communicates with his Indian parents, Dr. and Mrs. Koothrappali, through a webcam. In his spare time, Raj likes to stage mystery dinner theatre and scavenger hunts for his friends.